About a million people have asked me if I was kidding when I mentioned eating roasted birds at the Santa Greca festival. Absolutely not. This is a local delicacy and I suggest you give it a try at your next dinner party (it will definitely be something new for most of your guests). Since not everyone knows how to properly prepare roasted tordo, as the song thrush is called in Sardinia, I’m including a recipe passed on to me by my Sardinian handler, Paola Loi. First of all, you need to catch eight good-sized song thrushes. If you don’t have any thrushes in your neck of the woods you can substitute black birds, which are easier to catch but also a little gamier than the song thrush which tastes a bit like roasted dog, though not as fatty, when properly roasted. Pluck the thrushes without removing the entrails and then put the birds in a saucepan with a couple of sprigs of fresh myrtle and cover with water. Boil as you would hot dogs. When done, drain and generously salt the birds. Tie the birds in bunches and wrap their heads in more myrtle. Let them stand at room temp for a few hours. About 15 minutes before you’re ready to sit down to dinner, take the boiled birds and put two each on skewers, then roast slowly over a low wood fire, turning the birds every couple of minutes so that the skin is crisp but the entrails don’t explode. Serve over fregula (like couscous). Do not eat the beaks and stomach. 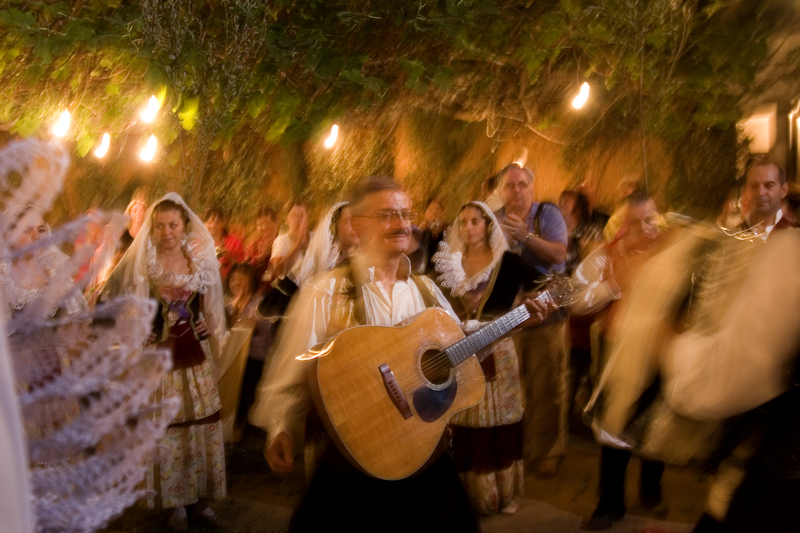 Not everyone in Sardinia is keen these days to break out the brocade vest and puffy pantaloons and do the Round Dance, but Vincenzo Atzeri and his family still like to give it a go. The trouble is that Vincenzo needs to round up a dozen or more dancers to join them, and they all need their costumes as well, and then they need to find a couple of guitar players, maybe someone who’s handy on the accordion, and someone else who knows what to do with a launeddas, an ancient three-pipe wind instrument that is sort of like a bagpipe without the big pouch underneath. But Vincenzo, who, if he had a beard, would be a dead ringer for Santa Claus, is one of the few people left on Sardinia who not only does a mean Round Dance but also has friends who play the accordion and the launedda. What are the odds? So he invited us to his house in Maracalagonis for an evening of Round Dancing and some of Mrs. Atzeri’s classic culungiones, which are large homemade ravioli stuffed with potato puree, mint, onion, and some pecorino cheese. The Atzeri family lives in a big complex that looks like it could have been a convent or something at one time. From the street you don’t really get any idea of the size of the place, but once you walk through the portico, the place opens up like a little city. When I arrived, Vincenzo was spreading branches of myrtle and mint and thyme on the cobbled courtyard (a nice little thing they do so that it smells good when you’re walking around) while a couple of cooks, under his wife’s direction, were making the culungiones. They showed me how to do it and I gave it a try but it’s harder than it looks. 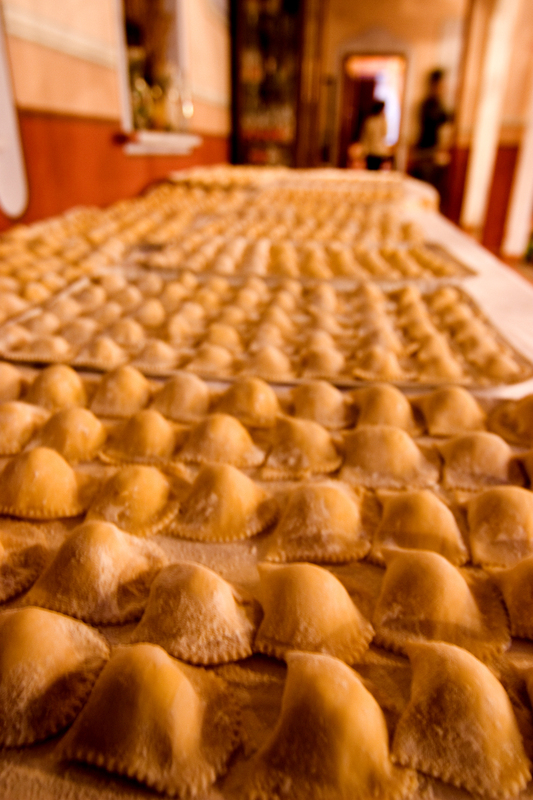 I was always putting too much or too little filing in the ravioli and then I could never quite get the proper technique down for folding over the corners of the pasta. We sat at long tables in a walled courtyard shaded by green vines. In the corner was a big firepit and two guys were roasting porceddu over myrtle wood. We ate, we drank lots of Vincenzo’s rosso, and then the accordion player started playing and a guitarist caught on and next thing you know, people were moving tables and chairs out of the way and doing the Round Dance. I don’t know what I can tell you about this except that it seems you stand in a circle (I guess that’s why they call it a Round Dance), and sometimes you clap and sometimes you hold your neighbor’s hand, and you move around in a circle one way and then reverse course for no discernible reason—sort of like the mating dance the flamingoes do. Which come to think of it is maybe where the Sardinians got the idea. In which case they should have called it the Flamingo Dance, don’t you think? One thing I really like about religion in Europe is that it has evolved into a comfortable form of mythology. They love their saints, particularly the ones that never existed. 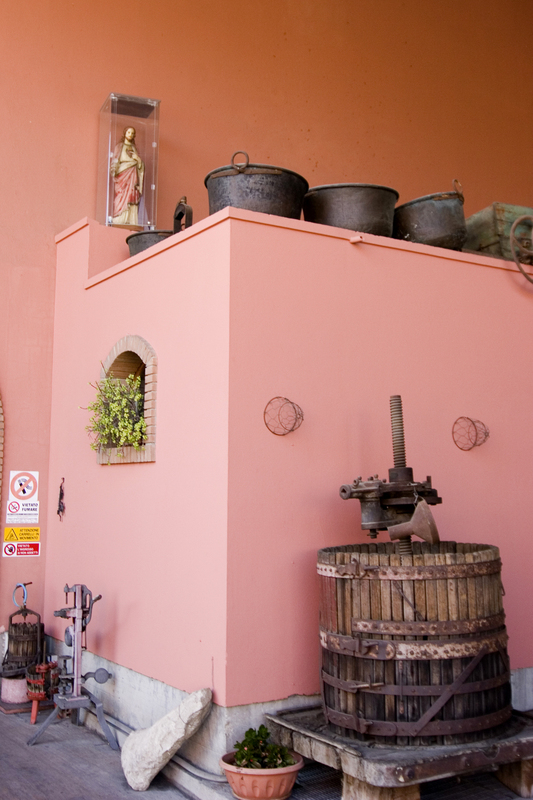 Yesterday as we were driving to the Comune di Serdiana to visit a winery, my handler, Paola Loi, told me that her generation has created a new saint—Saint-Precarious—to protect them from losing things like medical benefits, pensions, insurance. I laughed but she said, “It’s true.” You watch. A hundred years from now they’ll be holding festivals celebrating Saint-Precarious that rival the Santa Greca festival in Decimomannu. The Argiolas winery is to a Napa winery what a B&B is to the Ritz-Carlton. There are no giant parking lots full of buses and limousines, no picnic areas shaded by olive trees, no tasting rooms full of artisan vinegars and wine country cookbooks. In fact, unless you know exactly where you’re going, you probably wouldn’t be able to find Argiolas. 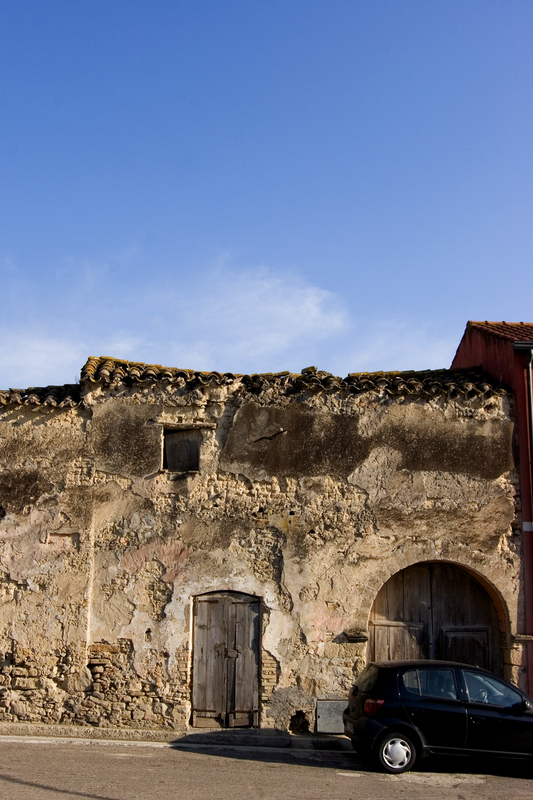 When Paola stopped the car, I didn’t know if the winery was somewhere behind the flamingo-colored wall to our right or the old adobe building across the street. Turns out we were headed for the flamingo building. Adobe across from Argiolas winery. We walked up a cobblestone drive towards a warehouse. Paola went inside looking for somebody—anybody—while I hung out front taking in some of the old winery equipment that testified to the fact that the Argiolas family has been in the wine business since the early 1900s (Antonio Argiolas, who started the winery, is still hanging in there at 102, though I think his days of stomping grapes are over with). Anyway, I’m looking at these old grape presses and stuff when I spot Him—Jesus—standing in a plexiglass box high up on the wall. God only knows how long he’s been stuck there, like an old raggedy bear in a two-bit circus, watching everyone come and go for decades on end while being restricted to his little box. It must get hot up there in the summer. And dusty. Not much to do other than spread his arms and bless each year’s harvest. Maybe having Jesus in a box in the winery makes the Argiolas family feel good but, frankly, I’d find it a little creepy. It reminds me of this monkey I once saw in Malaysia. It was on about a 3-foot-long chain that was staked in the middle of a barren yard in front of a little fisherman’s hut. It was put there to crack coconuts. People would come by and toss it a coconut or two and the monkey would break them against a rock and then they’d give the monkey a piece of fruit or something. That was the monkey’s life; crack a coconut, get a banana. All I could think about was freeing that monkey. But I didn’t. I just got on my bike and rode through the village. And now I’m standing outside this winery on Sardinia and I don’t know where Paola has gone or when she’s going to return. And I’m wondering if I could climb up to the ledge where Jesus is hanging out in the plexiglass box. And what He might do if I freed him. Well that’s a problem in Sardinia because meat is big here. You’ve got your suckling pig and roasted lamb, your intestines and donkey sausage, plus the odd kidney or lung. And let’s not forget the luscious cuts of horse. So off Marta went. And returned, looking all triumphant and everything, ten minutes later, with a big aluminum tin of something. She peels back the top and, with a big smile, asks if I’d like to try some of her barbecued eel. 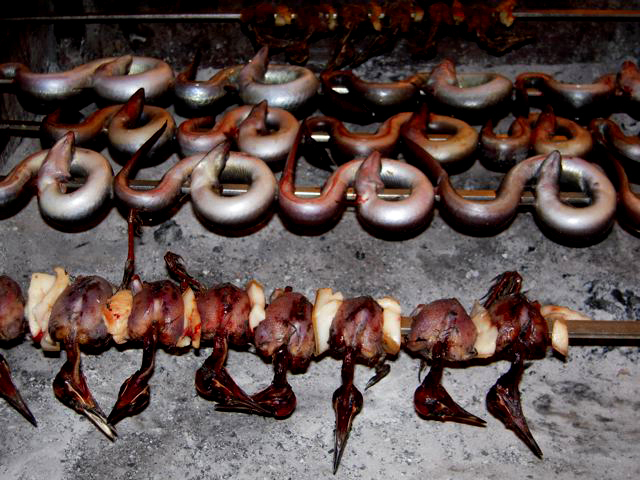 Roasted sparrows and eels, oh my. Photo by Nancy Marcantonio. “I thought you were vegetarian?” I said. So she digs in to the eel. Pulling back the eel skin to get at the flesh and sucking at the spine to get every last morsel of her roasted lagoon creature. “It’s really good,” she says, licking her lips. And all I can think is, She doesn’t eat meat? 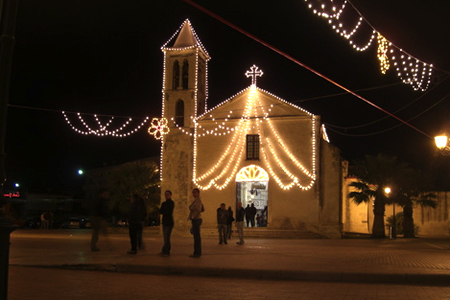 Last night I headed into Decimomannu for the Santa Greca festival. The thing I love about the saints of the Catholic Church is that most of them probably never existed. Like Santa Greca. 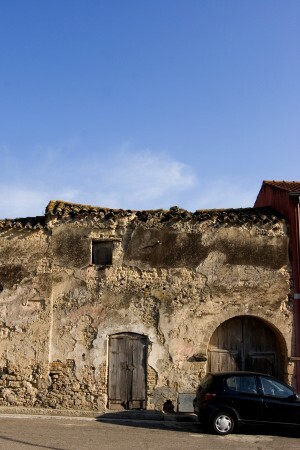 Here’s her story: About 400 years ago, give or take a decade, this little town in Sardinia decided to build a new church. So they started digging around and came across an old tombstone dating back to the 4th or 5th century saying that an unnamed Greek who lived two decades, two months, and 19 days, was buried there on Jan. 21 in some unknown year. That’s it. So the archbishop of Cagliari decides that since this woman was from Greece, she probably came to Sardinia because she was being persecuted by some nasty Roman emperor like Massimiano. Probably because she was a Christian. So he decides, what the hell. Let’s name the church after this woman who, because she has no name we’ll just call Santa Greca, and let’s have a festival to celebrate her. And that’s what they did. And are still doing. So how do they celebrate this mysterious Greek saint? 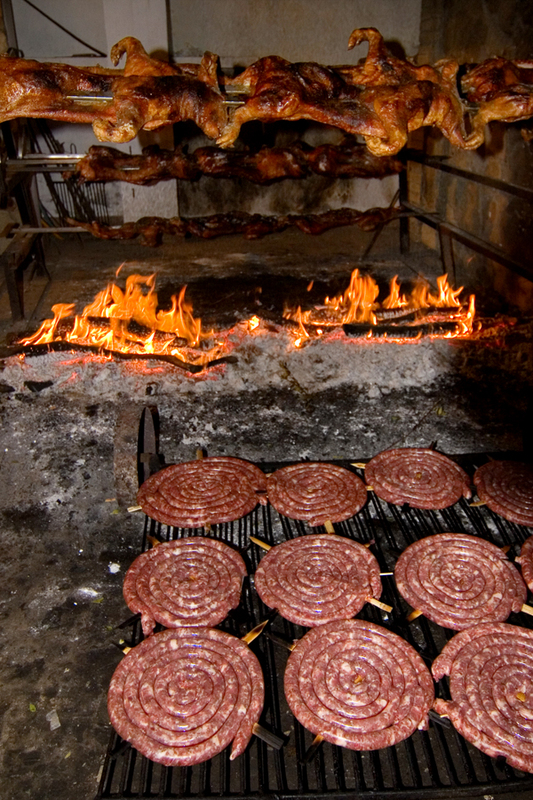 Basically by having a five-day barbecue in which they roast hundreds of suckling pigs as well as finger food like sparrows on a stick, eel shish kababs, stuffed sheep intestine, and donkey sausages. You can also get a nice cut of horsemeat if you want, but I don’t recommend it; it costs about double what a plate of suckling pig goes for. I hung out with Nicola and Sabrina Manconi at one of the outdoor barbecue booths, Gastromomia da Tonino, picking up some pointers on how to properly roast the suckling pig that they call porceddu. First of all, says Nicola, you only want pigs that weigh between 5 and 6 kilos. At that point they’re still nursing. Anything bigger than that and they’re on the pig feed and it changes the whole taste of the pork. Then you should cook them very slowly over a wood fire, carmelizing the skin (which, frankly, is the best part of the little porker as far as I’m concerned). But the most important part comes after the pig has been roasted. That’s when you take the pork and wrap it in aluminum foil with branches of myrtle on top. The hot pork sort of steams the myrtle leaves, releasing their oil and fragrance, and the flavor is picked up in the pig. So I bought a quarter of a pig plus some grilled intestines (just to snack on) and Nicola threw in some red wine, which he poured from a barrel into a recycled plastic Pepsi bottle, for free, and hunkered down on one of the long wooden picnic tables, eating the porceddu with my fingers and washing it all down with a long swig of rustic wine from my Pepsi bottle and I’ll tell you what—I was in pig heaven.